Description: Revival version of the Werewolf. Star Captain Only: Unlock the Were-Bite head attack! Lycanthropic Acid may sizzle your enemy for a period of time. Chance to heal you on strike. 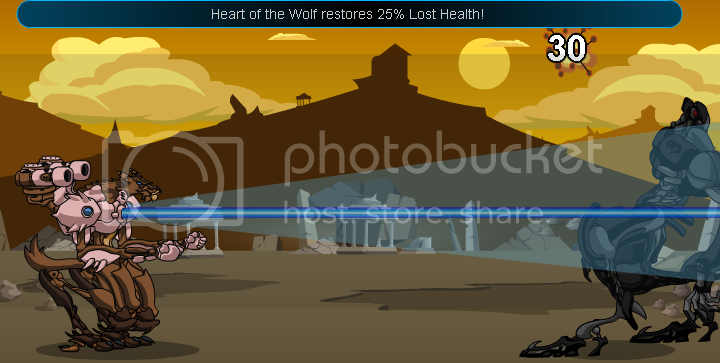 Chance for "Heart of the Wolf restores 25% Lost Health! ", restores 25% of the difference between your Max and Current HP even if it misses. Description: An attack that comes from the heart! Passionate heartbeat may do damage over time. First 2 Hits: Chance of "Spirit of Rage Grows! +16% Damage Boost! ", increases damage of the hit by 16%. 3rd Hit: Chance for "Spirit of the Wolf restores 30 Energy! ", heals 30 EP. Description: Calls forth the spirit of the wolf. Ferocious attack that increasingly damages with each hit. Small chance to heal back some Energy Points. Chance for "Pulse Multiplier! Extra Shot! ", does an additional hit of 100% damage. Description: Fire with the power of the Wolf. Chance to do an extra shot. 100% Chance for "Damage Increasing! Enemy Damage Decreasing! ", increases your Boost by 10% per turn (Feral Rage! Damage Increased: X%) and decreases your opponent's Boost by 7% per turn (Fear of the Night! Damage decreased: -X%) for 4 turns. SC Only: 100% Chance for "Dark Appetite Heals! X HP! Defender is affected by Lycanthropic Acid! ", heals X HP, where X is equal to the damage dealt, and causes DoT to the opponent for 3 turns. Description: Star Captain Exclusive! Lycanthropic Acid may sizzle your enemy for a period of time. Chance to heal you on strike.